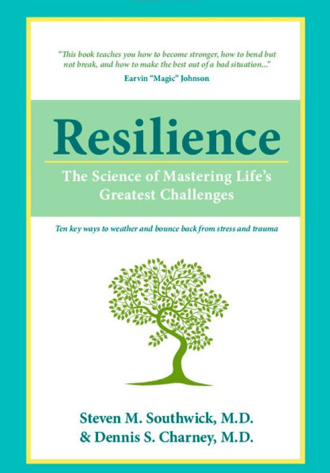 There’s a new book out — Resilience: The Science of Mastering Life’s Greatest Challenges. It’s written by Steven Southwick, a Yale Medical School and Yale Child Study Center psychiatry professor who specializes in PTSD and resilience, and psychiatrist and neurobiologist Dennis S. Charney, dean of the Mt. Sinai School of Medicine in New York City. On Huffington Post yesterday, Southwick explained why he and Charney wrote the book. One reason was because they’d always wondered why some people were able to overcome adversity and others weren’t. In the book they looked at three groups: former prisoners of war in Vietnam, Special Forces instructors and civilians who found the strength to carry on after traumas, including the attack on the World Trade Center. Because resilience is the complex product of genetic, psychological, biological, social and spiritual factors, we investigate resilience from multiple scientific perspectives. We synthesize the latest scientific and popular literature on the topic, describe our own psychological and neurobiological research on resilience, and quote from our in-depth interviews with a large number of highly resilient people. When we began our study, we assumed that resilience was rare and resilient people were somehow special, perhaps genetically gifted. It turns out, we were wrong. Resilience is common and can be witnessed all around us. Even better, we learned that everyone can learn and train to be more resilient. The key involves knowing how to harness stress and use it to our advantage. After all, stress is necessary for growth. Without it the mind and body weaken and atrophy. Yesterday, I had the good fortune to talk with an amazing man named Sherrell Childress who also displays resilience. His childhood was brutal — his father beat him regularly and hurled insults at him. The family was also economically poor and moved often — he never felt he had a home. He described his childhood as “living in fear”. He joined the Army, got caught shoplifting and was sentenced to a year in the brig. The first night, he was brutally raped. He was 17 years old. To make a long traumatic story short, he spent a couple of other stints in jail and lived on the streets for several years. The first time he did drugs was in the Army, and from that time on, he was never without. He and I were chatting at COTS — Committee on the Shelterless — in Petaluma, CA. COTS is an unusual homeless shelter. People can stay there for six months, if they’re clean and sober (the place does regular drug testing). They’re encouraged to attend classes and take advantage of programs such as “Rent Right” and “Work Right”, which provide members (that’s what people who live at COTS are called) with the skills necessary to find and hold on to housing and jobs. I’ll be doing a longer story about COTS later this year. Childress first came off the streets and into COTS in 2008. He lived there for six months, but didn’t participate in the classes, therapy or programs. He left and went back to using drugs. He did this a second time. “I had a problem with authority,” he says, “as you might expect.” He didn’t trust anyone to be on his side. He came by that decision naturally — he grew up in an environment where it wasn’t safe to trust adults. Then, late last year, during the second month of his third time living at COTS, as he was walking across a nearby parking lot one day, he was stopped by local police, questioned and searched. When he told his caseworker about the incident, she became furious. “That was when I realized that she was on my side, that this place was on my side,” he says. That was his entry into tapping into his resilience. He began taking advantage of all that COTS had to offer. This time, after six months, he graduated to permanent housing. He plans to go to junior college. He wants to learn about social advocacy. He works as an intern at COTS. With a COTS social worker, he makes the rounds of his old open-air haunts and talks with homeless people to find those who might be ready to come in off the streets. “They know me,” he says. “They open up to me.” Childress is 57 years old. During the years he was living on the streets, how many people looked at Childress and dismissed him as a lazy, alcoholic, drugged-out bum who would always be that way? Another way of asking that question: When do you give up on someone’s ability to exhibit resilience? Without a community like COTS to provide a safe place where Childress could develop enough trust, would he have been able to tap into his resilience? Since Childress’ story is one of thousands from COTS over the last 20 years, shouldn’t we strive to make sure that all of our environments — businesses, hospitals, clinics, prisons, schools, communities and homes — are helping children and adults build resilience? If you didn’t get a chance to hear NPR’s feature on ACEs (yesterday), which included interviews with the great author Paul Tough and a number of other experts on ACEs, it should be available to you as a free “This American Life” podcast through this link: http://www.thisamericanlife.org/. Thanks, Richard. That was SUCH a great program.